The story of Tanitoluwa Adewumi as covered by the New York Times and El País. | Images by David Llada. 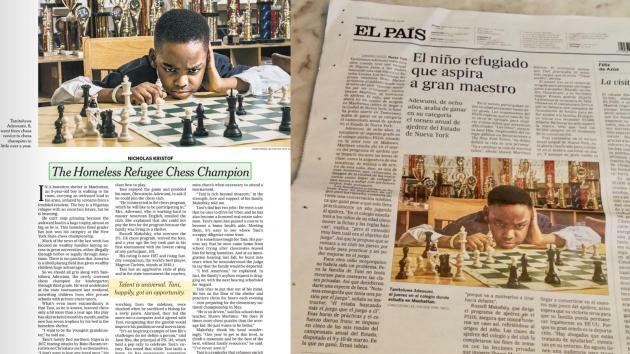 Although he is living in a homeless shelter and only learned to play chess a year ago, Tanitoluwa Adewumi, an eight-year-old Nigerian refugee, won the New York State Championship earlier this month. The story has been covered by major news outlets all over the world. Update March 25, 2019: a new column in the New York Times reveals that Tanitoluwa Adewumi and his family now have a home, scholarship offers from three elite private schools and a six-figure bank account that they have decided to dedicate to the church which helped them, and to other struggling African immigrants like themselves. Tanitoluwa was seven years old when he, his parents and his older brother reportedly fled from Nigeria in search for a safer place. Threatened by terrorist group Boko Haram, which is attacking Christians like his family, they left the country and ended up in New York in 2017. Tani, as he is called by his friends, began attending the local elementary school, P.S. 116 located in Manhattan's Kips Bay/Murray Hill neighborhood. There, a part-time chess teacher at the school taught him to play. Tanitoluwa Adewumi with his New York State Championship trophy. | Photo courtesy Russell Makofsky. When Tani's mother Oluwatoyin Adewumi wrote the school that her son was interested in joining the chess club, she had to add that she couldn't contribute much. The family was living in a homeless shelter. On March 9 and 10, Tani participated in the New York State Championship. He won the category for children of his age, kindergarten to third grade, with five wins and one draw. "I want to be the youngest grandmaster," he told the New York Times. Jane Hsu, the principal of P.S. 116, told the New York Times: "It’s an inspiring example of how life's challenges do not define a person." Credit should first go to the New York Times, and its two-time Pulitzer Prize winner Nicholas Kristof for reporting this remarkable story. Meanwhile, it has been picked up by e.g. El País, The Telegraph, NBC, CBS, Insider and Yahoo, and has close to 600 comments on Reddit. ChessKid.com hosted a booth at the New York State Scholastic Chess Championships this year. Photo: Mike Klein/ChessKid.com. Meanwhile, former U.S. president Bill Clinton reportedly invited Tani and his parents to his office in Harlem, saying: "Tanitoluwa, you exemplify a winning spirit – in chess and in life. And kudos to your hardworking parents. You all should stop by my office in Harlem; I’d love to meet you."